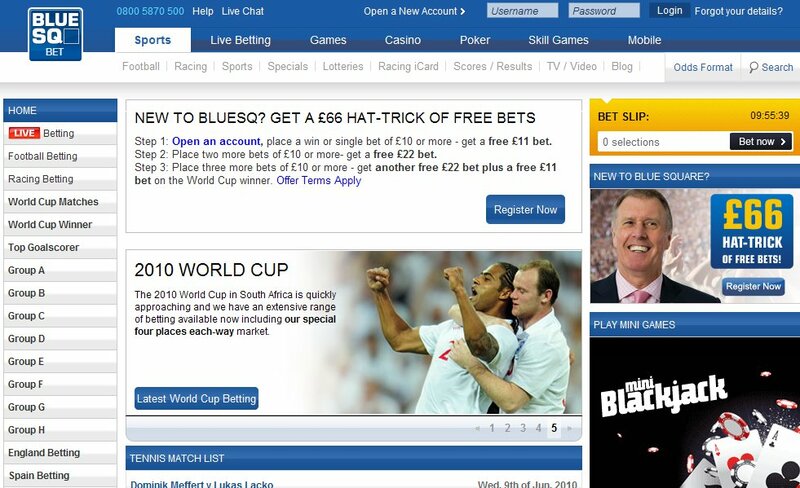 About Blue SQ - online british bookmaker review. Blue Square (Blue SQ) is a major online British bookmaker, and a part of the Rank Group which is listed on the London Stock Exchange. 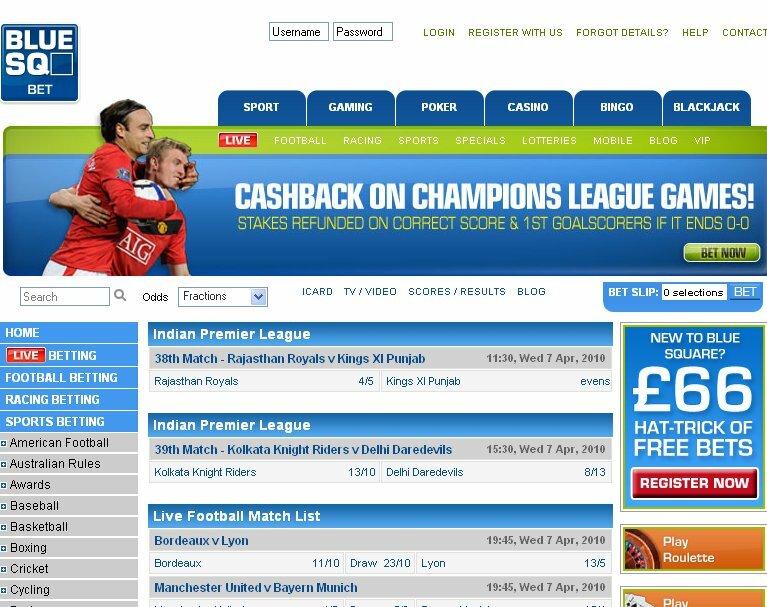 Blue Square online bookmaker was established in 1999. Early on, Blue Square was a wholly owned subsidiary of the Intercapital Group Ltd (ICAP) till January 2003 when it was taken over by Rank, one of the UK's prominent leisure and entertainment companies. Rank's assets include bingo clubs (e.g. Mecca Bingo), more than 30 casinos as for 2009 (e.g. Grosvenor and 'G' casinos) and online gaming. Together with the Rank Interactive Gaming, Blue Square bookmaker constitutes one of the major forces in the online gaming world with a combined clientele base of over 750,000 customers. Bluesq.com's sports betting offer comprises of such sports as horse and greyhound racing from the UK, Ireland and the US (both fixed odds and tote betting), football, rugby, tenis, football, ice hockey, Gaelic sports, snooker, darts and a few more disciplines. Bluesq.com's online gaming takes form of nice poker (extensive poker school and lots of promotions), casino (more than 60 games), games (slots, numbers, arcade), bingo and blackjack. For up-to-date information on football, horse and greyhound racing one can go to the Blue SQ's Radio Centre and Form & Results. Bluesq.com features Interactive Race Cards which are, first of all, fantastic source of information on all UK, Irish and South African racecourses. Some interesting sports previews can also be found on Blue SQ's blog. The betting services are available not only on the Internet, but also via Interactive TV, WAP and telephone. Since 2007, Blue SQ sponsors the lowest tier of professional English football – The Blue Square Premier. In May 2008 and 2009, the British bookmkaer sponsored the English Greyhound Derby at the Wimbledon Stadium. Since 2005, Blue SQ sponsors some professional poker players, such as Mickey Wernick or Praz Bansi. Interestingly, Blue SQ is the first company that has commercially sponsored West Bromwich Albion's shirt for a selective match, namely WBA's home fixture with QPR on 14 Dec. 2009. Blue SQ auctioned the match-worn shirts in aid of the Whizz-Kidz charity.